If you need help on how to identify email scams, you are not alone. Scammers have been using email for years and years. They create convincing messages that look official and lead innocent people into bad situations. In order to keep yourself safe, it’s important that you know how to identify the email scams that pop up in your inbox. You have a large family, so the thought of you having an uncle who is a prince in Nigeria may not come as a shocker to you. What may shock you though is that the fact your prince of an uncle just sent you an email demanding you respond promptly. Why the urgency? Apparently he has $1.3 billion dollars he wants to wire to you because you are his next descendant. Now, if you read that and chucked a little, then you are already aware of a big red flag when it comes to spotting an email spam. Let’s be real. While we DO use email to communicate over sensitive matters, $1.3 billion is a lot of money. Wiring over that amount of money is going to raise eyebrows and questions. The fact that someone you have never met, that possibly lives on the other side of the world, wants to award you with that amount of cash should be a red flag enough. While many of these scams that end up in our inboxes are no brainers if they are email scams are not, scammers are getting smarter every day. Of course, they know we’re onto them. Most of us aren’t sending them the $49 fee anymore so we can receive our lump sum of $1 million. Simply put: we get smarter, they get clever. This is why before we tell you how to identify email scams, we want to give you a few pointers to follow when using email to communicate with anyone. Avoid unknown links and attachments in the emails you receive. You, your friends, and your family email accounts can be hacked without you or them knowing. Which means it’s possible that even a familiar email address may show up in your inbox with an email scam. In fact, scammers often will hack an email account and then send email scams to anyone and everyone — plus more — in the hacked accounts contacts. In these emails they may include a convincing message that encourages the recipient to click on a link or download an attachment. Even a simple link click can lead an unexpected victim into a lot of misery. Many of these links or attachments will infect your operating system with malware. Malware is basically all of the scary things that have to do with computers: viruses and spyware. The scammers can install the malware onto your device without you knowing and obviously without your consent. Then they may use the malware to steal important information such as your credit card information or even your social security number. You can read more about malware on the Federal Trade Commission’s website. Confidential information should never be shared in an email. Not even in an email to your grandma. Grandma is asking crazy questions again. One day she is calling you and asking you to come help her figure out her computer. The next day she’s blowing up your inbox asking you questions like: “What’s your social security number?”. Email is such a common and frequently used form of communication now. There’s no doubt quite a few people are guilty of sharing more than they should in an email. While there are secure messaging programs available — that are usually made for businesses and cost quite a bit of money — your GMail account isn’t one of them. While there are secure options out there, almost any business is going to tell you they will never ask you for confidential information through an email or even over the phone. For this reason alone, if you receive an email that seems to be from your bank, asking for your social security number due to unusual activity on your account — pick up the phone. Regardless of how crazy you may feel for doing it, if you receive an email like this, don’t reply. Call your bank by using the phone number listed on their website and not in the email. Report to them the email you received and I’m sure the answer on if this is an email scam or not will be found right then. So, that’s basically the basis of making sure you are safely using email. Don’t email strangers or accept downloadable or link gifts from electronic strangers. 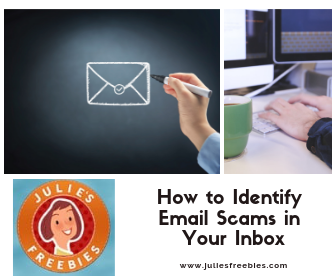 Instead learn how to identify email scams and nip them in the bud so they don’t have an impact on you. 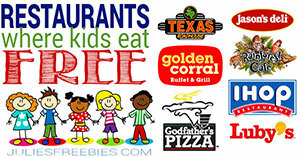 It’s not uncommon for website giveaways to award virtual gift cards as prizes. You may not even receive an email that you won and they may just send the gift card straight to your inbox. If your account doesn’t believe this is legit and like spam it has seen in the past, the email may be chunked right into your spam folder. Which, if you’re anything like us, rarely gets any attention. Somehow spam that is obviously legit spam nudges its way into your inbox folder. Then again, is it spam or did you actually win something from that contest you entered a decade ago? The email looks official and professional. They know a lot about me. It doesn’t seem like a ridiculous offer. Then again, maybe it’s just a scammer with some season behind them. Ready to communicate with their next unknowing victim. Before you hit that reply button, you need to do your own FBI work. Let’s make sure what you’re seeing in the real deal. Here’s our best tips on how to identify email scams. If you want to learn how to identify email scams, start your own extensive research. Google makes it easy to do some of your own personal research. The best part is that most of the time these email scams are sent in batches. They all contain the same content with the same promise of a money order of $1.2 billion dollars. Hopefully this email scam has been reported enough that you will be able to find out information right away. Google can be your best friend when you’re trying to identify email scams. First you can Google the email address the email came from. If others have had the same email sneak in their inbox, you may see all of the information you need. Tip: Even when you are checking links on Google, you need to make sure that the source is a reputable source. Not another scammer trying to lure you in with a $19.95 information finders fee. Unfortunately the answer isn’t always on the first page. Sometimes these scammers can be very clever, articulate, and super convincing. You would be blown away by the stories people share about communicating via email with people who try to scam them. I guess that means we should add “persistent” to their traits as well. If you want to find out if an email is a scam, you have to do some research. All that means is that you will have to do a little more digging. Especially if you fell into the scam before you were able to realize it actually was a scam. You don’t want them to get away with it. Just continue using Google search by inserting specific information about the email into the search bar. This information may be anything the people may have provided in their message. Including telephone and fax numbers, physical addresses, and any names mentioned (person, business, etc.). If you Google a business name and find any information that looks legit, give them a call using the phone number linked to their website. Keep in mind that even fake businesses will answer the phone like a real business. But, a real big red flag is if you call and they answer the phone like their taking a personal call with a simple, “Hello?”. If the email doesn’t contain any private or personal information, don’t be scared to ask your social media followers their opinion. Maybe one of them has also seen the same email in their own inbox recently. Hopefully with enough of your own research you will be able to identify email scams within minutes. Pay attention to the content of the email. While some email scams may come off as quite professional, that’s few and far between. That is unless the email only contains this amazing graphic that states you just won all of the money in the world. We’re visual beings and pretty graphics pull us in fast. But, we already talked about how you should never click links or download attachments if there is any kind of uncertainty. It’s a big no. Most of the time scammers don’t put a lot of thought into how the actual message sounds or looks. The header of the email is usually broken or filled with weird characters. In the body of the email you will often find sentences that may seem to make a point. They are just are not formed in a way you can understand. The email is also missing quite a few punctuation marks. It may also come off as overly urgent and pushy. Ordering you to do something within a ridiculous time frame so you can claim something you knew nothing about. Scammers steal people and business identities to send out eerily accurate email scams. It doesn’t take much knowledge or time to find out how to spoof the email address you are sending messages from. Scammers go as far as sending emails that contain email addresses that look like popular companies. Netflix and PayPal are both popular services that people spend millions and millions with. They are also two companies that have suffered thanks to their users falling for email scams. What happens is the scammer will use a program to spoof the email address they send the message from to match the company’s actual email address. Well, that’s what the person receiving the email sees on their end without any further digging. Companies such as Netflix and PayPal have been the victims of email scams. Email scams that have hit Netflix and PayPal customers often trick the customer into thinking their account has been compromised. The email may say their account is suspended or frozen. It may say that they need to click a link to reset their password due to security reasons. If you happen to click the link, you may even end up at a website that looks just like where you would reset your actual PayPal or Netflix password. Basically, the scammer has went above and beyond to jack your information. They have stolen every business branding aspect of a company you trust and made you believe that they were who they say they are. Once you’ve visited the link and fell into their trap by resetting your password — you may be taken to some awkward page. You may even be taken to a confirmation page. You’ll just find out that it was all wrong the next time you actually visit the PayPal website to check your balance and they say your password has been changed. If this happens, you need to contact PayPal right away so the issue can be resolved. The longer you wait the more time the scammer has to ruin your identity, finances, and private life. Scammers can be whoever they want to be when they send out email scam. In addition to their very business-like emails, they may also claim the email is from a super important person. We often find email in our spam folder that contains subjects claiming that the email is coming from the FBI. Here’s an example of one of those emails from my personal spam folder. Although I must admit this one is not formatted well at all and throws off so many “this is a scam” warnings. Make sure that all names associated with the email match up. 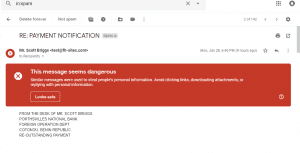 If you’re somewhat familiar with on how to identify email scams, one thing that may stand out when checking over a message is matching everything up. One way is by matching the email address with the rest of the message. Scammers will often ask you to email a different email address with you reply than the one the email was actually sent from. Emails may also be signed by a name or include a company that is in no way, shape, or form a match to the email address it says it is from. Let’s say you receive an email from randyp86689@isendemailscams.com. But, the email is signed by Jennifer Smith with a law office located in Africa. That obviously doesn’t match up with the sender email address. Something more along the lines of janderson@lawofficesinafricanotscam.com would have been more believable. The email starts off in all caps from someone that is from the Foreign Operation Department that wants to speak to me about a payment they say they owe me. The name the email is from is far from foreign and a very generic name. Now, if you scroll down some you will see the sender also asks that you respond to an email address that is different than the one the message is from. Remember not to click on any links in a suspected scam email. Even if it’s a supposed link to their business website. Instead you can just type the business name into a Google search and find the information you are looking for without any risk. Research the internet presence of the company the email says it is from. Hop on Facebook, Twitter, Instagram, and any other social media outlet and search for the company listed in the email. See how many followers and likes they have. Look at their reviews on social media and on Google. It’s more likely a business is a scam if they have a Facebook page with two followers than hundreds. Don’t forget to check out the website they claim is their businesses. Go to their sections that tell about the company background, who runs the company, etc.. For the best results, visit all of the main pages of the company website and match up the information you see there to what you have in your email and what you see on social media. Find out if the email message is authenticated. Before we explain how to check if a message you receive in authentic, we want you to make note of one thing. Sometimes even legit emails may come through as not being from an authentic source. This doesn’t automatically determine that the message is spam. You can find out more about why a legit message may come back as not authentic on the Gmail Help website. Ok, so here is how you can check and see if the email you just got in your inbox is authenticated or not. Checking if an email message is authenticated with Gmail. Google makes it super simple to check on how legit an email is. Especially if you have an Android device. Open your Gmail app and open the email you want to check. Click on the “View details” option and then select the “View security details” option. Both headers must include the same domain name at the end. Going back to the email above, you can see below that the email headers for this specific email do not match. Check if an email is authentic if you DON’T have a Gmail account. If you’re using a mail client such as Outlook, the steps are a little different. The main thing you are looking for now are the Email Headers. Each email service will have different steps you have to take. If you use Outlook as your email service, you can check the headers in just a few simple steps. Open Outlook and open the email you want to check the headers for. Click the “File” option and then the “Properties” option. The email headers are listed in the “Internet headers” box. Google has a great breakdown of most of the popular email services, like AOL and Hotmail, and how to check their message headers. You can visit their help article on how to trace an email with its full header. Scamming people is a serious offense that is not taken lightly. People across the world have been scammed out of billions and billions of dollars thanks to email scams that lure you in with attractive promises. Attractive promises you will never get. All they really leave you with is a huge mess to clean up and a throbbing headache. Reporting the scam may not give you instant gratification, but it will leave you feeling proud in the end. By reporting email scams you have a greater chance the scammer is caught and lessen the chance of the same thing being done to others or even possibly you again. While it will not eliminate scamming at a whole, it is definitely a start. In the United States, you can forward the entire scam email message to spam@uce.gov. This email address is for the United States Federal Trade Commission (FTC) and the part of their department that handles scam emails. You should also file a complaint by visiting the FTC Complaint Assistant website. In addition to having the chance to report any email scams, you can also learn a lot more information on scams to watch for, notorious scams, identify theft resources, and much more in relation to protecting your identity online. Everyday people fall victim to email scams. They share account passwords, banking information, social security numbers, and more with people they believe to be trustworthy. Becoming a victim of an email scam is the last thing anyone would want to go through. Especially if you do not become aware that you have been scammed until later down the road. Sometimes it isn’t always evident right away. Not until the scammer has really put a dent on your bank account and credit cards. In addition to reporting the scam email, here are a few more steps you need to take to protect your identity in the event you may have shared information with a scammer. Contact all of your financial institutions to report you are a victim of a scam. Even if you don’t believe your bank or credit card information is at risk, you should still contact all financial institutes you have an account with. This includes credit card companies, loan companies, and banks. By contacting them and giving them a heads up, hopefully you will be covered if your accounts feel any impact from your situation. Report your incident to all of the major credit bureaus. It doesn’t take too much information to try and get credit approval in someone’s name. Especially if you have all the right information. Often companies will do instant approvals without any actual photo identification. Giving your scammer instant access to the line of credit they opened in your name. We can only assume the person who sent you the email scam isn’t going to pay the bills for the credit they took out in your name. Instead they will probably use it all up, maybe open more credit, and then leave you in default. Owing the credit card companies for their shopping spree. This is why something you must do when you discover you’re an email scam victim is contact all three major credit bureaus by phone. These companies are Equifax, Experian, and TransUnion. We have provided contact information for each below. Order new forms of identification. While whoever sent the email to you may not have your driver’s license in their actual possession, that doesn’t mean they don’t have a picture of it or the information from it. When you fall into a scam email, the best thing to do is to just go ahead and order new forms of identification. This includes any government issued IDs. Such as drivers licenses or military IDs. In most cases, the first replacement is usually free. Sometimes there may be a small nominal charge that is only a few dollars for replacements. When you identify an email scam, you’re looking out for you and your family’s well-being. You’re taking the steps to do your best to avoid these simple emails that can end with less-than-desired results. Have you ever been the victim of a scam? If so, what steps did you take to keep your identity safe? What steps are you taking now to prevent falling victim to a possible scam in the future? Let us know! Your experience may help someone in a life changing way. With so many email scams surfacing over the years, make sure you share these tips with your friends and family as well. Social media is the king (or queen) of everything online right now. With the rise in popularity of sites such as Facebook, Instagram and Twitter scams are becoming more common. Internet criminals go where there are large amounts of people they could potentially victimize. Knowledge is power when it comes to preventing yourself from becoming a victim of an online scam. Here are some things you should know! If it sounds too good to be true, it probably is. I feel like this is a rule of life that goes back as far as time. If someone approaches you online claiming you have some insane inheritance or you won some exorbitant amount of money (or physical prize) then chances are it is too good to be true. This is especially true with things you have never even heard of. No, you didn’t inherit 30 million dollars from some relative you didn’t know existed. No, you didn’t just win some prize you never even entered for. Ask lots of questions, always. Anyone who is legitimately contacting you about something you won or are otherwise entitled won’t mind asking questions. Scammers however, tend to get uneasy when asked a lot of questions. Also, don’t be afraid to find alternative contact methods for the company you think you are talking to. Companies won’t mind being approached to verify if something with their name on it is legit or not. NEVER NEVER NEVER NEVER pay money to claim a prize! If anyone ever asks you to pay money for a prize it is a scam. Never pay shipping, never pay fees, never pay ANYTHING for a prize you won! RED FLAGS: Western Union, Cashiers Checks and Money Orders. This is probably one of the biggest red flags of any scam. Western Union, Cashiers Checks and Money Orders are a non-refundable system of payments. The reason that scammers want these forms of payment is because they can easily cash out and disappear with no risk of you getting your money back. Increasingly online scammers are asking for credit card numbers over various messaging platforms! NEVER, EVER SEND CREDIT CARD INFORMATION THROUGH MESSAGING! Stranger Danger. Be especially skeptical of people randomly contacting you. Not all online people contacting you are going to be scammers, but that doesn’t mean you shouldn’t be skeptical when conversations with a new person initially starts. Just as you would have a guard up in person if a stranger approached you telling you they had money for you, have your guard up online. Spelling matters. I am certainly not the best person when it comes to grammar or spelling (in fact, I think I am rather horrible at it). That said, I am pretty sure that you can tell that English is my native language. Any company contacting you about a prize (or anything else) will have decent language skills. Typos are okay, but most scammers are going to type, chat and talk as though English is not their native language (they are usually from other countries). But they said it isn’t a scam? Then it probably is. Most reputable companies, businesses and bloggers would SHOW you why they aren’t a scam. Not just tell you. People can say anything they want. Block the scammers. If you think you are being contacted by a scammer, block them from talking to you any further. Trust your gut instinct on these things, and it really goes back to RULE #1: If it sounds too good to be true, it probably is. Online scams are here to stay. So long as the internet is here, scammers will be here as well. Knowledge is power, if you know what to look for you can prevent yourself from becoming a victim. As always, if you need help identifying if something is a scam or not, message me on Facebook. I will help you out, even if it has nothing to do with my website. I set out for the month of July to save up every free thing that I got by mail that was posted right here on my freebie blog and I was pleasantly surprised at all of the goodies I got. I went a little OCD with this project and even calculated the value on every item that I could. I know a lot were trial sizes so I broke them down by the full sized products cost by ounce (or whatever measurement) and divided down so that I could have as close of an idea as possible to the total value. The results: Over $312.32 in FREE stuff in just 1 month! It was a pretty big month with some nice valued items but still any way I break it down it looks like if you claimed everything that I posted here regularly you should be at around or above a $200 value monthly! Just for coming to my site and claiming stuff! There were some other items that I got for free but since they were coupon ones I left them out of the picture, I only wanted to consider the stuff that I got in the mail at no charge. Take a look at the picture below of my loot. Below that I have written out each item that I got and its value! 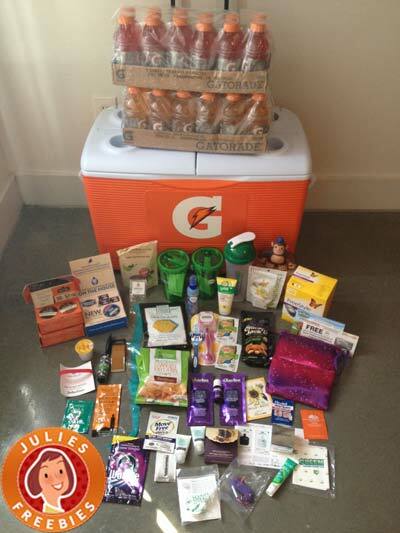 Let me know what you got and as always feel free to post pictures of your loot on the Julie’s Freebies Facebook Wall! 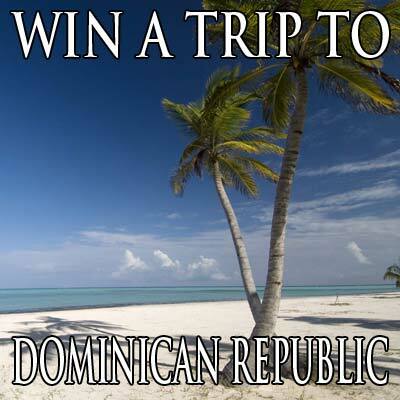 Here is an offer from Wed Pics where you can enter to win a trip for 2 to Punta Cana in the Dominican Republic! Enter this one before September 3, 2013 if you want the chance to win it! Happy New Year to each and every one of you. 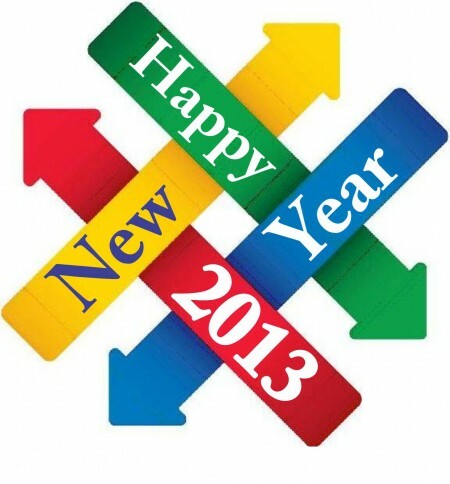 I hope that 2013 brings you all health and happiness! 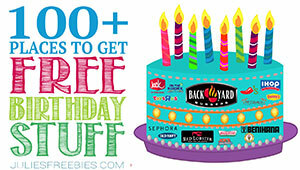 2012 was a great year for Julie’s Freebies, and is the first full year that this was a site. It grew a great deal and I can’t wait for next year and grow it even bigger and better! If you have any suggestions for the site, please feel free to contact me!